Pride and Porters by Charlotte Greene is a modern-day adaptation of Pride and Prejudice. The amiable, financially struggling brew master meets the ultra-rich ice-queen. It’s a dynamic that I love for the start. This story is solely told from the perspective of Erin Bennett. 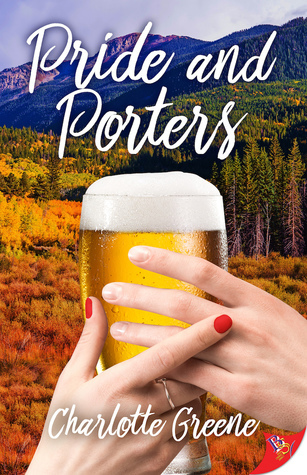 Erin is the brewmaster and part owner of Bennet Sisters Brewing (BSB), a small, but well-respected brewery in western Colorado. BSB is turning out great beers but they need financial support to expand and keep up with the demand for their product. Erin keeps the weight of the world on her shoulders. Her business is seriously struggling, her relationship with the father is poor and the mounds of stress are only going to get bigger when Charlie Betters and Darcy Fitzwilliam walk into her life. Darcy is, as you may have already guessed it, rude and snobbish. She immediately shoots her mouth off running down both Erin and her sister Jen. Therefore, Erin has a massive issue with the woman and wants zero to do with her. This aversion to Darcy is hard since Jen and Charlie begin dating. Darcy and Erin are forced to interact with each other both women she each other in a new light. Overall the book is well written. It is an interesting story with great details and sets the scene perfectly. I could almost feel myself sitting in a taproom ordering a beer and enjoying the beauty of Colorado. My one issue and it’s a big one is I didn’t feel the connection between Erin and Darcy. They have constant missteps that cause issues between them. What you don’t feel is emotion. I needed more dialogue between the two leading ladies. You get a lot of what Erin is struggling with but none of that was what draws her to Darcy other that she is gorgeous. More than anything I wish these two had a conversation. Great dialogue is what can set a book apart from all the others. This one just needed some great conversations.